Sony has announced its FE 50mm f2.8 Macro, a full-frame, lightweight 50mm macro lens with a 1:1 reproduction ratio and a minimum focus distance of 6.3 inches. The lens, which includes an extra-low dispersion element, is also dust and moisture resistant. Sony 50mm Macro. Dust, moisture resistant with deep-set front element. The design sets the front element back far enough that ghosting and glare are minimized weven without a hood, the company said. Sony said the 50mm lens will be available in September for $500. Adorama and B&H will be accepting pre-orders on Sept. 11 for $498. The lens offers a 6.3 inch minimum focusing distance and a wider field of view for capturing more background, compared to longer focal-length macro lenses. Weighing in at a mere 8.4 oz., it's extremely lightweight and portable, making it easy to carry around. 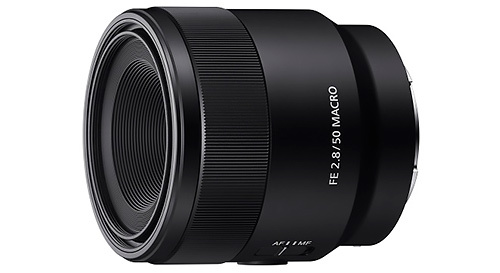 The new FE 50mm f2.8 Macro lens will be available in September for about $500 and $650 Canadian, respectively. It will be sold at a variety of Sony authorized dealers throughout North America.